The farther we get in 2016, the better the silver price outlook is. 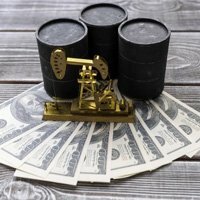 That's promising news for investors seeking returns in an unstable commodities market. This fact may seem counterintuitive to most silver investors, though. That's because they know the U.S. Federal Reserve plans to raise interest rates in 2016. And interest rates typically have an inverse relationship with the silver price. Even so, there's one trend that will cause silver prices to rise in 2016 despite the Fed's meddling. But before we touch on this trend, let's look at how interest rates affect the silver price. 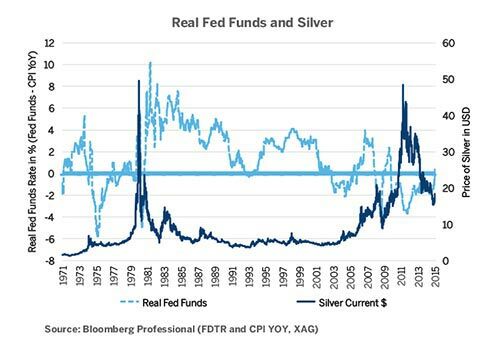 Historically, the silver price falls after rate hikes. When the Fed raises interest rates, the U.S. dollar appreciates. That makes dollar-denominated commodities like silver more expensive. In turn, this lowers the demand for silver and sends the silver price down. Higher rates also make investments that generate income more appealing than precious metals. Note: The Real Fed Funds Rate is inflation-adjusted. For example, in 1975, the Fed lowered its funds rate below 2% to fight inflation from the 1973 oil crisis. After the Fed's policies fully kicked in, there was a huge spike in silver demand around 1980. But when the real fed funds rate normalized to 6% in 1980-1981, the price of silver fell from $50 an ounce to $10 an ounce. The Fed projects two additional rate hikes in 2016 – at only 0.25 basis points each. That's tiny compared to previous interest rate hikes. These hikes will only have a mild depressing effect on silver prices. Investors are buying silver derivatives at the fastest pace in more than two years: a trend that will overcome any resistance from future Fed rate hikes. Holdings in silver-backed, exchange-traded products (ETPs) spiked 845.6 metric tons in March, according to Newsmax. And according to Bloomberg data, total holdings of these ETPs logged 19,486 tons on March 28. This was the highest increase since April. Hedge funds and speculators also increased their long-term position in U.S. silver contracts by 6.6% last week – the highest level since 2006, according to Newsmax. 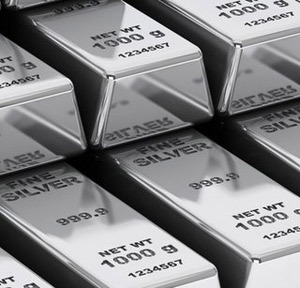 "All of this means investors are more interested in the safe-haven benefits of silver than in the Fed's effect on the silver price," said Money Morning Resource Investing Specialist Peter Krauth, a 20-year veteran portfolio manager with special expertise in commodity trading. The caveat: Krauth said he expects more short-term weakness for silver prices as the dollar gains strength. But after that, Krauth said the price of silver will resume its upward climb. As of Tuesday's close, silver was trading at $15.14 per ounce. There must be a consumer market of value out here, based not on instant profits/prices, but the sheer number of us VSNI's. (Very small nervous investors). Who, if old enough, or still listen to their parents, remember what actually happens in a crash. Everything simply vanishes. Especially the lousy return "safe" "investments". The friendly Banks. Asians – who are really expert at safety, rely on gold and – if really poor – silver. AND they bury it somewhere. It works. My Polish family did it and survived both the Germans AND the Russians in WW2. I remember the inflation of Zimbabwe….personally. AS there isn't any physical gold left anywhere for peasants and 500 claimants for each ounce of "shadow gold", why is there not a seriously active promotion of physically owned/held silver in the West? I MUST be seriously missing something here, as the only real investment return of mine in 30 years was by buying Silver coinage, whenever I could afford some. Gold never was for the peasants and we peasants are going to POSSIBLY NEED a currency. One that won't dissolve in a computer, or inflate. Am I really missing something here?